ZF Friedrichshafen and Tenneco make significant contributions to the ride and handling of the new Mercedes C-class coupe. ZF, of Germany, supplies the car's standard McPherson spring struts on the front and the rear dampers. Mercedes-Benz refers to this suspension setup as "agility control" because at normal speeds with low shock absorber impulses the damping forces are automatically reduced, resulting in less road noise and tire vibration. When shock absorber impulses are greater, for example when cornering at speed or performing evasive maneuvers, the maximum damping forces are set and the car is stabilized. 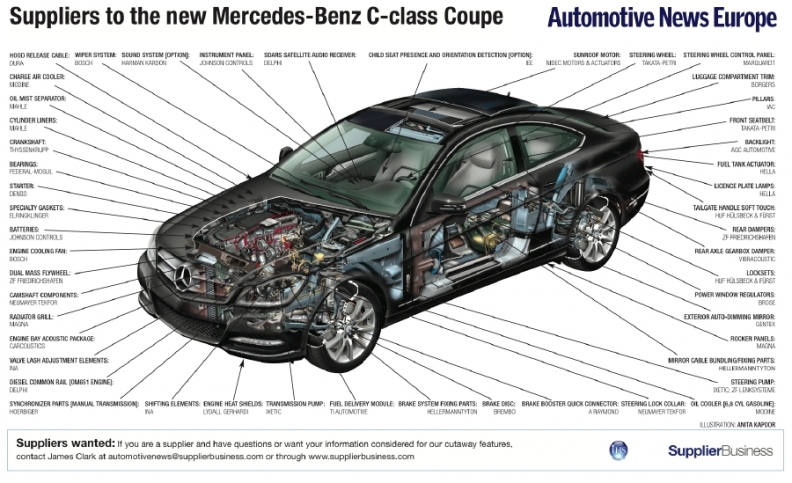 Mercedes also offers the coupe with its optional Dynamic Handling Pack, which features front and rear CES dampers from U.S.-based Tenneco. CES, or Continuously Controlled Electronic Suspension, is a semi-active suspension system that continuously adjusts damping levels at each wheel according to road and driving conditions by using an advanced valve system. The valves are integrated and work together with an electronic controller and chassis sensors. Launched at the 2011 Geneva auto show to round of the new Mercedes-Benz C-class range, the new coupe has been in production since last March. It is built at parent Daimler's factory in Bremen, Germany.